Think of it as a non-digital wearable device. While exposure to some sunlight is necessary for the body to produce Vitamin D, we all know that getting too much sun is not a good idea – among other things, it can cause sunburn, skin cancer and premature aging of the skin. 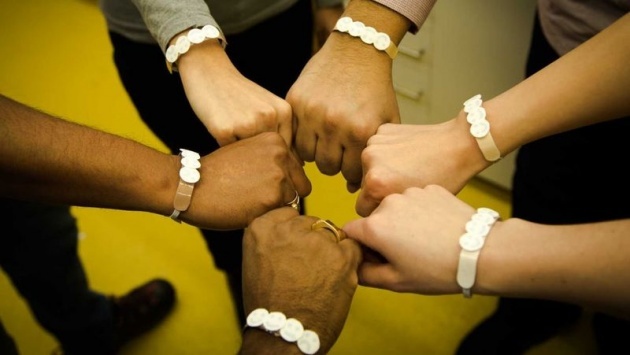 With that in mind, a cheap new paper wristband has been designed to let us know when to seek the shade. Created by scientists at Australia's RMIT University and Spain's University of Granada, the one-time-use disposable device features four paper discs arranged in a row, each one with a progressively less-happy smiley face printed on it. Those faces are printed using a special ink containing phosphomolybdic acid, which gradually turns from colorless to blue as it's exposed to ultraviolet (UV) light. Going from left to right along the row, each face is coated with an increasing number of transparent film layers, which block some of the incoming UV rays. Upon initial exposure to the sun, none of those faces are visible. As the user stays outside, though, the faces sequentially appear – the first/smiliest one indicates that the user has only received 25 percent of their maximum safe amount of exposure, with the next two indicating 50 and 75 percent. Once the last/grumpiest face has shown up, they've reached 100 percent and should get inside.